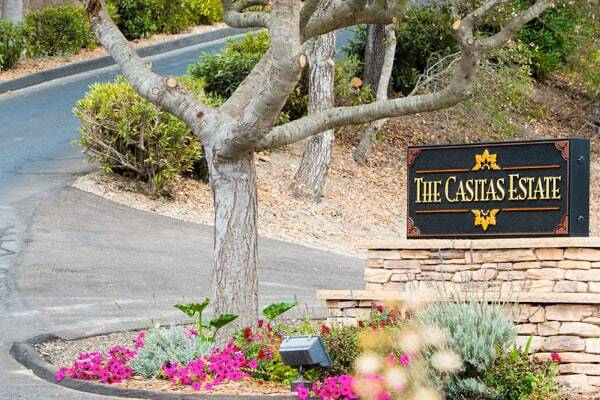 The Casitas Estate Site Fees — start­ing at $7,800 and up to $18,800, depend­ing on your needs. please use our Con­tact Us form to inquire about spe­cif­ic pack­ages & rates for your wed­ding date. Seat­ed max­i­mum for Infin­i­ty View Lawn is 180 guests. Use of out­door cater­er area on day of event with water, elec­tric, and light­ing. Ter­ra cot­ta tiled dance floor, 16 x 24′ — large enough for 180 guest counts. We want to make it as sim­ple as pos­si­ble for your spe­cial day. Option 2: ‘Let’s Do It All Here’ (Add-on a sec­ond event dur­ing your wed­ding week­end). Host your rehearsal din­ner here before your wed­ding or a morn­ing brunch for par­ties up to 50 guests. This add on option also includes shut­tle ser­vice and coor­di­na­tion. We under­stand that some­times you’ve select­ed anoth­er venue for your event, but still want to enjoy and relax with exclu­sive use of the sev­en acre Estate prop­er­ty for lodg­ing and pri­va­cy. Gor­geous views of vine­yards and the San­ta Lucia Moun­tains can be enjoyed from the boc­ce court, pool, and love­ly tree cov­ered grounds and Infin­i­ty Lawn. The Casitas Estate can offer you, your fam­i­ly, or clos­est friends a loca­tion that is the ulti­mate pri­vate, peace­ful escape as your week­end lodg­ing com­pound.